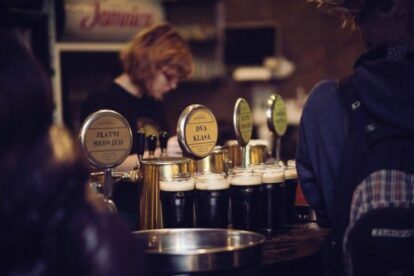 The Medvedgrad beer hall and brewery started work on December 22, 1994, on the corner of Savska and Vukovarska streets, as the first mini-brewery and beer hall in Zagreb. I have to say that I discovered it a couple of years later and from then it became a place I visit on a regular base – a drink with friends after work, family gatherings and even business dinners. Here you can enjoy six kinds of year round beers – Zlatni Medvjed lager, Crna Kraljica ale (dark beer), Mrki Medvjed (mixture of lager and dark beer), Dva Klasa wheat beer, Fakin IPA, and my personal favorite extra strong Grička Vještica. In addition you can choose among seasonal beers and bottled beers. The beer served here is not filtered and has no preservatives or artificial ingredients. As befits the culture of beer drinking, dishes served are calorific, spicy and salty, and in the offer meat dishes like veal roast, veal knuckle, various sausages and grilled meat dominate. But if you feel like just having a bite to eat, order the delicious “čvarkuše” (savory pastry made from čvarci) and cheese rolls. It goes great with beer, especially if you’re with a group of friends in a good mood. Because then you can order a beer KEG, 10L of delightful beer served at your table in a KEG :-)!